At approximately 7am on Wednesday morning police entered a protest camp dubbed “Swamp Line 9” and rapidly began making arrests. 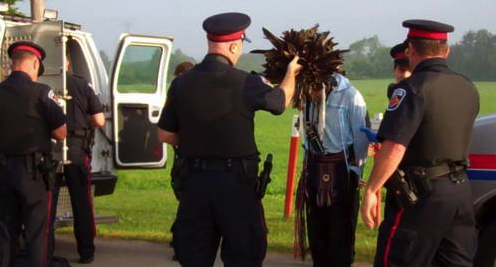 Protesters had occupied the site since Thursday, June 20, in order to block construction at an Enbridge Facility in Hamilton that will be crucial in a plan by the company to pump oil from Sarnia to Montreal. The initial arrests took place at the front gate of the camp where the bulk of the protesters were gathered. Approximately 300m away, a smaller group of activists had locked themselves to a barricade that they had constructed immediately outside the construction site. However at the time of the police raid it was impossible to see what was happening at this barricade from outside of Enbridge’s property. At 7:20 am, shortly after the front gate was cleared, a convoy of vehicles drove in the direction of the barricade. The convoy was made up of police cars, (including two paddy wagons), a backhoe, several work trucks, a portable crane and other machinery. Some of the 18 protesters arrested on June 26, 2013. At 7:23 several activists who had not been arrested were allowed to leave by car. As a freelance journalist reporting for the Media Co-op, I had already made my way to a nearby baseball diamond where I could see the front gate of the site. At 7:50 I was approached by two police officers who asked me to join other journalists who were cordoned off in a more out-of-the-way location. Theses journalists had almost no information on what was going on at the site and I was interviewed by both CBC and CHCH. I have since received unconfirmed reports that many of the protesters received trespass tickets. (Ed: confirmed reports that protesters have been released with trespass tickets, 6 people are still being held in custody. Police liasons not on the property itself were also arrested. Alex Hundert tweeted that “All 5 yet to be released will be getting non association charges with the other 15 arrestees”). 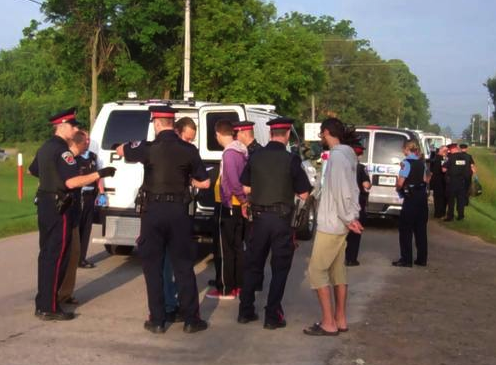 Eighteen protesters were arrested at the Enbridge pumping station in rural Hamilton on Wednesday morning, ending a six-day-long occupation of the site by a group that opposes changes to how it’s used. In a statement, police spokesperson Debbie McGreal-Dinning said the protesters were “arrested without incident” and told CBC News in Hamilton earlier in the morning that some people were allowed to leave on their own. Police charged 13 protesters, men and women ranging in age from 19 to 25, with trespassing. One man, a 51-year-old of no fixed address, was charged with breaking and entering with intent to commit mischief. Four others face mischief charges. McGreal-Dinning said those arrested were from communities across southern Ontario, including Hamilton, Guelph, Toronto, Bowmanville, Brampton and St. Catharines. Graham White, a spokesperson for Enbridge said the company gave protesters “ample time” to leave the site after an injunction was issued on Tuesday. “It was done in a quick, efficient and peaceful process,” he said. White added that Enbridge still has police on site and are doing a safety assessment. He added that initially it appears the protesters did no significant damage to the site. Police said the roads around the hamlet of Westover, where the pumping station is located, are now open. “They’re taking people from the back [area of the site]. People are concerned they [Hamilton police] will be rough,” Gayle said. She added that she didn’t think that anyone had been hurt. McGreal-Dinning said that protesters on site were allowed to leave Tuesday after the injunction calling for their removal had been received. Freelance journalist Tim Groves was with the group overnight and woke up to a commotion just before 7 a.m. He said police gave some the option to leave and he thought a dozen people had been arrested. Westover resident Joan Gerritsen welcomed the police intervention, and what she hoped is the end of the protest. Enbridge obtained a court injunction around 8:15 a.m. Tuesday morning for the protesters to leave. But four remained and formed a blockade, said David Prychitka of Hamilton, a spokesperson for the protesters. Prychitka read a statement from Trish Mills, one of the protesters in the blockade. Protester Elysia Petrone said members of her group experienced “intimidation” from a small number of Westover residents during the occupation. Petrone said some area residents were polite and helpful to her group, including one who apologized on behalf of the community for how the protesters had been treated. The pipeline from Sarnia to Montreal is divided into two sections — Line 9A and Line 9B. The National Energy Board has already approved the flow reversal of Line 9A, which runs from Sarnia to Westover. It will hold public hearings on the second leg of the project in the fall. Line 9 crosses several major rivers that drain into Lake Ontario and the St. Lawrence River, as well as Spencer Creek, Hamilton’s largest watershed. Opponents say the pipeline will carry diluted bitumen from Alberta’s oil sands, which is heavier and puts the line at greater risk of a rupture. Posted on June 26, 2013, in Oil & Gas and tagged Enbridge, Enbridge line 9, Enbridge Line 9 Hamilton, stop line 9, Tar Sands. Bookmark the permalink. 2 Comments. And on and on the oppression of life and destruction of our Mother goes, where it ends we all know!